Los Glaciares National Park is home to the magnificent Fitz Roy Massif and more glaciers than any other region in Patagonia. The park is renowned for its day hiking - nowhere else can you walk straight out of your hotel door onto a hiking trail, to eat lunch right by a glacier. Almost all the trailheads start in the town of El Chalten, something of a hiker's mecca right in the Fitz Roy range. One of the delights of hiking here is that you can spend each day exploring all the different viewpoints, lakes and mountains and return each evening to a comfortable hotel in this welcoming, lively mountain town. The popular Laguna de Los Tres and Laguna Torre treks are not to be missed, but there are also a number of other, gentler trails to explore close to the town. Allow a little extra time in your itinerary to ensure that Patagonia's unpredictable weather doesn't prevent you from seeing the peaks. This route provides arguably the best viewpoint in the national park. 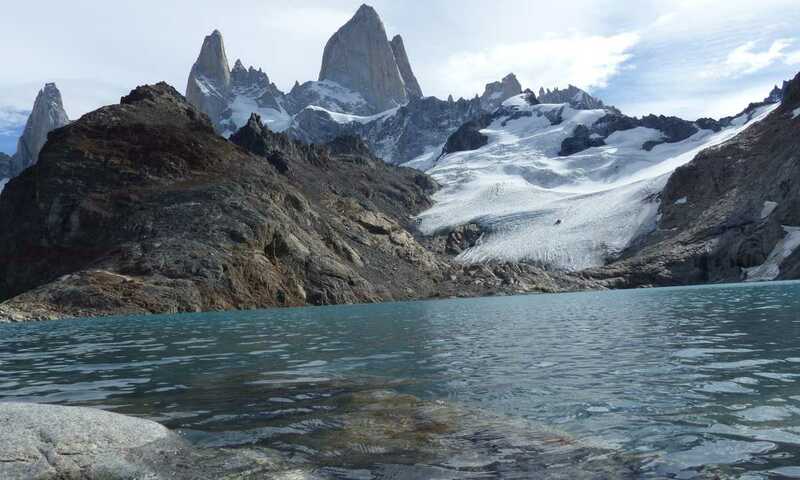 Los Tres (The Three) refers to the peaks of Cerros Fitz Roy, Poincenot and Torre, all of which can be seen in the magnificent 360 degree views from the shores of the lake. While it can be done as an out-and-back hike from El Chalten, it's a more interesting day if you get transport to Hosteria Pilar and start on a forest path from there. You'll then begin with views of Piedras Blancas glacier, before a steep ascent to the lake, returning to El Chalten past the beautiful Laguna Capri. A reasonably gentle hike up a perfect glaciated valley to gain wonderful views of Cerro Torre from the lake. The climb is only 250m or 350m if you continue on up to the Mirador Maestri lookout point. Loma roughly translates as 'hill', but this route still takes you some 1,000m above the town of El Chalten. The effort is worth it for a completely different perspective on the mountains, and the views of Lake Viedma as it loops south around the Fitz Roy massif. Although the altitude gain is significant the trail is relatively easy going and you can always cut a couple of kilometres off the end. The rocky terrain is a great place to find fossils. To be able to walk out of your hotel door into such dramatic, majestic scenery is a real privilege. This is truly some of the best day hiking in the world. Los Huemules Reserve is a 5,800 hectare private reserve north of El Chalten. It was created 15 years ago to preserve the ecology of this area, and has mostly been left to grow wild in the hope that huemules, foxes, magellanic woodpeckers, condors and puma will find sanctuary there. There are a number of trails of varying difficulty. Although you don't get the spectacular views that you will get from Laguna de Los Tres and Laguna Torre, these hikes are special because of their solitude, exploratory nature, the pristine landscape and diversity of species within the reserve. To the north of Fitz Roy lies the Electrico Valley, where a gentle hike winds through forest paths, bringing views across the valley to the distant Marconi Glacier. A rustic refugio and campsite can be found at Piedra del Fraile itself. The Condores Viewpoint overlooks the town of El Chalten, and lends itself to spectacular panoramic views of the massifs of Torre, Fitz Roy and the Valley of the Vueltas River. Glaciar Huemul can be combined with a boat trip on Laguna del Desierto to get you close to a glacier in just one hour of walking. The two main day hikes can be cut short for less intrepid hikers. 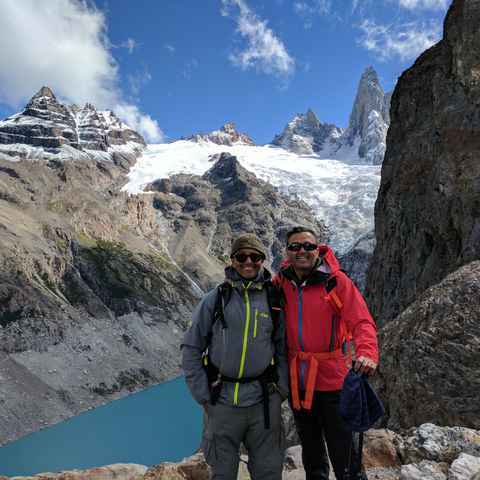 The Laguna Torre hike can be shortened to just reach Mirador del Torre, where you still get the views of Cerro Torre. Laguna de Los Tres can be shortened by stopping at Laguna Capri for good views of Mount Fitz Roy. Amazing experience. Accommodation excellent, the 2 best guides we've ever had and the area breathtakingly beautiful. Juli and Pablo our guides looked after everything. Their explanations of what we were doing, their timings, making sure we had everything, their walking pace for our group and Juli organising some delicious snacks for our border crossing, every detail was covered. Not only that, they were extremely knowledgeable and fun! Los Huemeles reserve was a particular favourite...we only passed 2 people all day! Making it to Laguna De los Tres, jumping in the frigid waters and camping with the range in sight. Incredible! Overall El Chalten was my favourite place! I hiked every day and it was very easy to find the routes and they all led to stunning viewpoints. El Chalten is special. Although a remote town, we (as outdoors people) felt at home with the vibe and the people. The popular hiking trails were well-maintained, but we were very glad to have our guide lead us on the lesser-travelled paths as there were areas we would have had a difficult time determining our way. Highlight was waking up to see Mt Fitz Roy, bathed in the glory of the morning sunrise, with a surreal deep golden reflection, in a cloudless blue sky. It happened to coincide with my brother's birthday, which was an added bonus, and a priceless birthday gift at the same time. What day hikes can I do in the Fitz Roy range? How hard are the day hikes in the Fitz Roy range? The three main day hikes are challenging with 20 km (14 miles) of hiking, and each climb up to 1000m. The steep climb on scree at the end of the Laguna de Los Tres hike is particularly tough, especially in bad weather, so you do need to be comfortable hiking for a full eight hour day. The main hikes can all be shortened, but if you're looking for more of a relaxed hiking experience there are many alternatives just outside of El Chalten. Aguas Arriba Lodge, a short drive north of the town, is a great base for some of the alternative, shorter hiking in the region. What do I need to carry on day hikes in El Chalten? Do I need to carry water? Layering is key: pack a base layer, thermal mid layer and a waterproof outer layer. Wear good waterproof walking boots with ankle support and carry a 30 litre day pack with an extra layer, water bottle, a sandwich from the bakery in El Chalten and your camera - don't forget the sun cream! You only need a one-litre bottle of water, you can fill up from streams along the way. Do I see more if I camp rather than staying in El Chalten? The campsites are very basic, with just a long drop toilet, but they do allow you to get views of Fitz Roy and Cerro Torre at sunrise when they will glow pink and orange. By camping you can also walk shorter distances each day and still get to the main viewpoints or explore some of the less well-known valleys close to the Ice Cap. See our Multi-day hiking page for more. How do I get to El Chalten? El Chalten is a three hour drive or bus from El Calafate airport and town. We suggest most people take the bus because it is comfortable and fast. 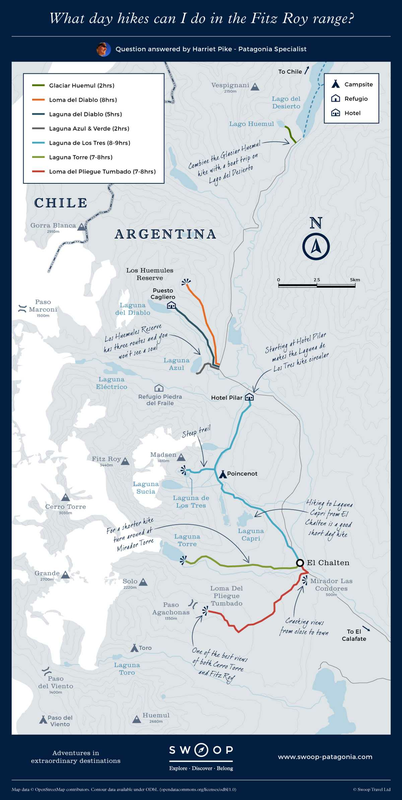 There are also some overland ways to travel to El Chalten which you can see on our How to get to Los Glaciares map. ​A climb​ing and hiking​ mecca​;​ El Chalten is the ​heart of​ Los Glaciares ​National ​Park. The town lies within the park's boundaries, making it possible to enjoy adventurous day hikes to some of its best spots (such as Laguna de Los Tres and Glacier Torre) before returning to El Chalten at night to eat, relax and sleep in a comfy bed.